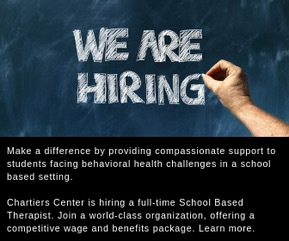 Join our team committed to providing compassionate supports to students facing behavioral health challenges in a school based setting and at one of our innovative and unique outpatient facilities. This position requires this clinician function independently and assists the Agency in growing our School Based Services. This is a vital role and an excellent opportunity for a licensed therapist. Our child based programs value excellence, flexibility and person centered care. This position provides individual and occasional family/group therapy to children and adolescents. This clinician also has the opportunity to provide back up to clinical services in our Outpatient Clinic based on consumer needs and the school calendar. Schedule flexibility available. We will work with full or part time candidates. The staff and leadership of Chartiers Center are committed to providing compassionate support to those in need who face behavioral health, co-occurring disorders, or IDD challenges as they transform their lives. The Agency has grown its service offerings so that a wide range of programs, service types and service locations are available to adults with intellectual disabilities, consumers with mental health needs, individuals and families dealing with substance abuse and the homeless community. Services range from treatment and medication monitoring, to day programs, outpatient therapy, substance abuse services (treat consumers 12 years of age and older ), case management and residential programs to serve a variety of consumer needs and multiple housing options to support the homeless or those at risk of losing their home. Full time position available / Part-Time Job Share Available, Monday through Friday, daylight; evenings to coincide with required school activities. Requires LCSW or LPC with 2 years experience, 1 of which is with children/adolescents. Managed care credentials required. Chartiers Center offers a competitive wage and benefit package. At Chartiers Center we do not just accept diversity, we celebrate it. We thrive on diversity for the benefit of our employees, our consumers and our community. Chartiers Center is proud to be an equal opportunity workplace and is an Affirmative Action Employer.